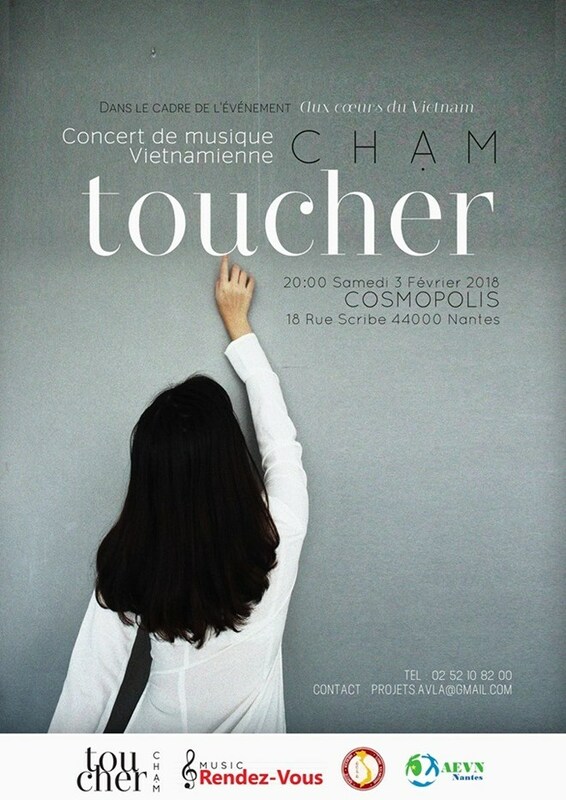 Hanoi (VNA) - A concert titled Cham (Touch), hosted by the young musician Hoang Thu Trang, will bring French audience a glimpse of Vietnamese music and culture. The event will be held in the cultural centre Espace Cosmopolis in the city of Nantes on February 3 night. This is one of a series of art activities organised in the framework of AuxCoeurx du Vietnam (To the Hearts of Vietnam) to celebrate Vietnam Month in Nantes. The event is organised by 80 non-professional artists who are Vietnamese students, Vietnamese residents of France and French people living in Nantes, Paris, Lorient and neighbouring provinces and cities. Aux Coeurs du Vietnam is organised by Vietnam Loire Atlantique Friendship Association and the Association of Vietnamese Students in Nantes. The event features more than 20 activities introducing Vietnam, its history, people and culture. It takes place from January 31 to February 18 in Nantes. An exhibition featuring the costumes of the 54 different ethnic groups in Vietnam was held at the opening event on January 31. The concert Cham (Touch) will bring the audience to Vietnam – the S-shaped country in the Southeast Asia with spectacular landscapes, rich culture and diverse food. Each song in the concert will include French subtitles and be accompanied by fine images, which help to give the audience the opportunity to ‘touch’ and feel the quintessence of Vietnamese culture. “I combine traditional Vietnamese music with modern melodies, accompanied by images and light in order to bring the best experience to audience. There have been many difficulties as most participants are non-professionals and many in the team do not speak Vietnamese fluently but must perform in Vietnamese. We have been practising for three months to mount an hour on stage. Music will make us overcome all the geographic and language barriers and bring us close together,” Trang said. In this concert, Trang will debut her latest song – Ha Noi Cua Em, Ha Noi Cua Anh (Your Hanoi, My Hanoi). Mai Dinh Lang Bien (Communal House of a Coastal Village) song is a sweet, peaceful melody about Vietnamese heritage and the dinh lang (communal house), a place of community and worship that has been preserved for years. Cheerful, festive melodies depicting the traditional Tet of Vietnamese people with the signature items of peach blossom flower and banh chung (square sticky rice cake) will also be featured. The beautiful and poetic images of the capital of Hanoi with Hoan Kiem lake, the flower season, the street covered with golden leaves and small alleys are illustrated in the two songs Hanoi 12 Mua Hoa (Hanoi, 12 Flower Seasons) and Ha Noi Cua Em, Ha Noi Cua Anh (Your Hanoi, My Hanoi). The concert also introduces the audience to the unique features of Vietnamese music such as the flute or ca tru (ceremonial singing). Nearly 80 non-professional artists prepared for the concert. They include Musique Rendez-Vous music band, comprised of Vietnamese students in France, and NEST VIET orchestra, whose 40 members are Vietnamese mothers and their children growing up in France.